If you missed the 40/1 I suggested recently you can still get 33/1 Demba Ba for top Premiership goalscorer with the (non) fearless layer VCbet, should you still have an account open and operational with them. The Newcastle player tops the scoring chart tonight on six goals and is as short as 12/1 with Ladbrokes, Skybet and Bet365. I have a feeling it's not going to be my day today! Two close seconds with Defence Council and Long Awaited. Then Chil The Kite finishes 6th and PP pay on first five! I may have a bet in the 17:45 but if I do it will be after the above race. Will probably be an additional bet in this race in the morning. Poor tennis selection yesterday and my horse selections finish last and second last. It happens. Thought it worth having a look at how the blog stands with regard to overall profitability. Stakes 1,798; Profit 26; % Profit 1.4% - not very inspiring but on the right side! Probably get back to the bread and butter stuff tomorrow with a wager or two at Haydock. I know I should stick to the horses, however I fancied a small bet on the Japanese tournament having watched Woza beat Li Na today. The Dane recovered well from a set and a break down to close the match out with confidence. Having had a poor year Woza is at last showing a bit of form, having won the Korea gig last week. I didn't hold out much hope for Triple Dream as it was a massive drifter. After taking 12/1 BOG it drifted to 28/1 or so on betfair and started at 16/1. In the end it was beaten less than a length. Unfortunately that was not good enough to finish in the frame, ending up in fourth place. I can't grumble given the recent run though. Another quiet day tomorrow with possibly one selection at Pontefract. Back in the winners' enclosure with success at Beverley and Folkestone. What a shame Folkestone is closing - we've been cleaning up here this summer! The winners were both subject to 20p R4 deductions so Danzoe pays out @ 8/1 as mentioned earlier whereas I Confess, backed at 12/1, pays out at a respectable 9.6/1 (SP15/2). Total profit on the day was 33.12 points to eclipse yesterday's disappointment of a 11.9 point loss. After today's excitement it's likely to be a low key day tomorrow with just one race under consideration at Goodwood. Danzoe scoots in at 13/2. We took 10/1 but with a 20p R4 which means an 8/1 payout. Disappointing day with three seconds and a third including two "neck" defeats. Folkestone may produce betting opportunities if it goes ahead tomorrow which it may not. One race at Beverley is of interest. I've had a small bet on an outsider which may not turn out to be the main selection in the race. It finished last in its latest three races and for the last two outings it has been trained by A Crook. The earlier Hamilton bet on Captain Scooby with WH @ 10/1 pays out at 14/1 (place) SP because it was BOG. Further inspection at Hamilton at 11:45. In any event I'm going to use the same strategy as yesterday and consider further Hamilton bets once we've seen how Captain Scooby gets on in the 14:10. If you missed 10/1 with WH that price is available with skybet as I write. A quite remarkable day on the horses. Three selections, two winners: @ 16/1 (SP 7/1) and @ 10/1 (SP 11/2). Profit on the day was 69.5 points to take the flat season selections to over 200 points profit with a yield of 20%. I am happy to admit it's been a very poor year for sports betting. Terrible results at Euro 2012 and the Olympics with only average tennis returns. Even the jockeys' championship went pear-shaped! My mid-season strategy was to try and pull things around by making a good profit on the horses. 2012 has now moved (perhaps temporarily) into marginal profit overall. Given the poor sports betting results I'd be happy with anything near break even for the calendar year. After all we were 700 points in front coming into January 2012. Hamilton may not even go ahead with the heavy rain forecast but if it does last year's winner who is a soft ground performer should have a good chance. More selections from Hamilton tomorrow if it's on and probably something at Leicester too. Really good chop at Hamilton 16/1 winner - returned 7/1 - no R4s either! I may have further bets at Hamilton after the above race has taken place. 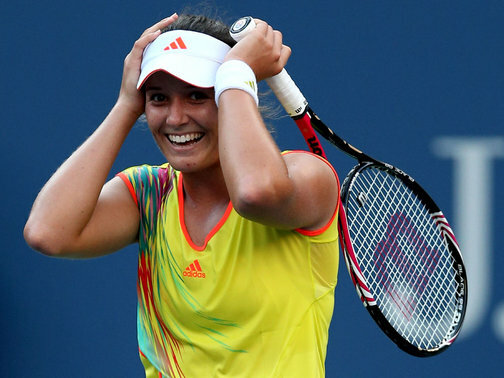 Laura Robson has continued her improved form in China. She has beaten the Chinese numbers two and three having beaten the Chinese number one Li Na at the US Open. Indeed she has beaten three players ranked above her in reaching the final of the Guangzhou tournament: Zheng Jie (22), Cirstea (30) and Peng Shuai (47). Laura is currently ranked 74. She is the first British female since Jo Durie to reach the final of a WTA event. She is very likely to win it too. Shadowtime does the business trotting up at 16/1 (SP an incredible 15/2). Eighteen points profit on the day and now five days of consecutive horse racing profits. In this period we have accrued over 48 points profit and that does not include the AOB 50+ point return. Didn't think I'd be having having a football bet this season however last night's match has changed that. Demba Ba scored twice for Newcastle only coming onto the field in the second-half. Last year, in the first-half of the season, Ba was a revelation scoring 15 Premiership goals before the January window to lie second in the TGS table. Then it all fell apart. He departed for the African Cup and during that time Newcastle signed his Senegal team-mate Cisse who was promptly given the iconic number nine shirt. He was to do the shirt justice scoring a notable 13 Premiership goals for Newcastle in what remained of the season. Having missed three Premiership matches because of the African Cup Ba was to score just once more - on 5 February - to end the season on 16 goals in seventh place. This was despite playing in most of the remaining fixtures. He finished just one goal away from joint fourth place and two away from outright fourth which was frustrating for ew TGS backers including me! I watched the three Arc trials from Longchamp yesterday with interest. Of the three races I thought last year's runner up Shareta was the most convincing winner. She is still priced at 10/1 with Paddy Power to go one better this year. I am not getting heavily involved as yet because the draw is important. You need a horse drawn in single figures and maybe in the first six depending on the ground. Only one winner but Secret Look does the business. Great price 9/1 as SP only 9/2 (No R4!). Profit on the day's selections is therefore 4.5pts. But of course AOB wins only four English classics so the blog wins 53.5pts on that particular market (2pts @ 12/1 and 3pts @ 10/1 less 0.5pt on the full set). I didn't get to see much racing today but was able to cheer Secret Look home in a betting shop in Abergavenny having also watched Camelot fail to win the Leger minutes before that. After a horrible day on Thursday when I didn't even pick up a place, Chester has turned things around. In the first race the selections went 1-2. I could not understand the riding tactics on the 9/1 shot though, I thought it would be ridden like it was at Chepstow - straight out of the gate and try to make all. Instead the rider took a pull and went round the outside of all the runners to end up being beaten just a neck. In the second race Going French made all from trap two. The big surprise here was the SP. We took 100/30 BOG with Betfred but will be paid out at 9/2! Nine points staked on the day, return 28.80 points. As you know I have backed A O'Brien to win four or five English Classics. You will see from the above link that I remarked at the time VC was offering 50/1 the full set, a price unavailable to me, hence - in part - the reason for having had such a modest bet @ 40/1! Hopefully you lucky VC customers availed yourselves of plenty of the 50/1! On 1May I topped up with 3pts @ 10/1 four classics. So you can see now that AOB NOT winning the Leger will yield a profit of over 50 points for the blog whereas a Camelot victory will result in just 15pts profit. Clearly we cannot address this imbalance as there is no value in backing Camelot. Jack Luey breaks his run of third places (six) by finishing second! Good news for ew backers is that despite three non-runners there was no rule 4 deduction imposed by Bet365. Likewise with W Hill if you took their 18/1 ew this morning. However some firms have deducted a 5p R4. Consequently we have a return of nine points for our three point investment. Probably bets from Doncaster and Chepstow tomorrow. What a difficult call SPOTY will be this year. Plenty of Olympic gold medalists with valid claims. Now Mugray enters the picture, not only as a gold medal winner but now as a grand slam winner (ending 76-years of hurt etc). Mugray is now second favourite (behind Wiggins) at around 3/1. I have already lost money on this market - on Queen Victoria - who is now an 800/1 chance on betfair as I write. Clearly winning a gold medal and looking good won't be enough - although success in "Strictly" could help. We had no chance of Berdych beating Mugray in the semi. The Czech's high ball toss proved to be a big problem in the near tornado conditions. Despite that he played quite well in winning the first set. Mugray must now have a decent chance of beating Djoko in the final. The latter leads the H2H 8-6 but I thought Mugray was very impressive at the Olympics when I was fortunate to be there to see him beat Djoko 7-5 7-5 on Wimbledon's grass. The match is due to start at 9pm UK time. Disgracefully you cannot watch it on terrestrial TV. However you can watch it for free on Livescorehunter.com on your laptop or desktop PC. 16:30N 6 x 0.30pts combination forecasts above selection with Iceblast and Ryedale Dancer = 1.8pts staked. Good results from Haydock with 14/1 chance narrowly beaten and then nice 9/1 winner. I may have some bets at Chepstow and/or Haydock depending on the ground. It's currently good, good to soft in places at Chepstow but drying out. I'm going to the Ludlow food festival today so if I post any further bets it's likely to be during racing this afternoon. I can never seem to get Mugray right. I thought he might struggle against Raonic and he won easily. Surely though he is going to have a much tougher match against Berdych in the semi-finals. Murray is 2-4 HTH with Berdych. The latter won their latest encounter albeit on clay. Berdych leads Mugray 2-1 on hard courts. What about their US Open performances? Berdych played really well in beating world number one Federer as well as players ranked 12 and 28 in the last three rounds. Mugray has beaten players ranked 13, 16 and 31 in these rounds and only played really well in one of these matches in my view. I think Berdych is the value at just over 15/8 with Pinnacle (2.93). He is 15/8 with Stan James who closed my account yesterday. More of this later. Good start to the day with Hoarding obliging at Lingfield (9/2>11/4). Would have been the unluckiest loser of the season if Buick had not found a gap close home to eventually win a comfortable neck. Angelito has just gone in too, survived a stewards but didn't look like ever losing it in the stewards' room. There was a R4 on the race but I have been paid at SP (15/8) because of the WH BOG stipulation. One more runner today at Kempton. Just waiting now for the Italians to come on court between the showers. Ladbrokes initially went 13/8 about this one so it's a bit of a drifter. Possible bet at Kempton and/or Lingfield tonight, will post later. Meanwhile Vinci v Errani scheduled for 16:00 UK time. Should be interesting. Obviously you should only have the above bet if you took the 100/1 Vinci to reach the semis recommended on 25 August 2012. Bear in mind the above wager will be void if one set is not completed. You may prefer to hedge with Coral or Ladbrokes who both state one point should be played for the result to stand. Well Radwanska has been. Carved up by Vinci in tonight's match. I think it's time to have a little bet opposing Mugray. He looked beat at the end of his last match against Lopez in which he squeezed through in four hours. Mugray has in the past been a terrible match-up for Lopez so it was a surprise to see him run Mugray so close - in fact Lopez won more points. Fourth consecutive winning day on the horses with Whitstable Native obliging @ 6/1 (SP 5/1).